Abinadi Meza's installation, "The Burning Question" (Katherine Nash Gallery, Minneapolis, Minnesota, May 11 - June 4, 2004) explored Intellectual Property, Copyright, and the impact of property on culture. 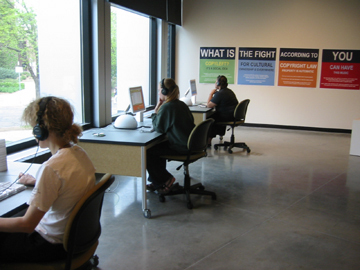 Visitors were provided with computers, blank CD's, and over 24 hours of copyleft audio works contributed by composers, musicians, and sound artists from around the world. As visitors generated playlists to burn themselves CD's, they also generated an Internet radio broadcast streamed from the gallery. The gallery becomes a studio/radio station and users become DJ's. The following text is Meza's essay for the show's catalog (download catalog pdf). How is culture linked to property? Every day we face the growing problem of exclusive control over art, music, computer technology, agriculture, medicine, and numerous other creative works. For artists, this question is quickly complicated by the need to protect one’s own work from exploitation and the desire to reach or affect a wide audience. As cultural participants our daily activities and creative gestures prove to be socio-political acts with global significance. As Joseph Beuys said, we make Social Sculpture as our ideas shape the world in which we live. It is clear that those who profit the most from private control over creativity are deeply threatened by recent changes in our technological abilities. If we are able to communicate with others over vast geographic distances, we might also share artifacts and information freely, thereby undermining the primary motivation for commercial creativity—profit. Sadly, these profits are often paid by those without a voice in the dominant system of ownership and access. A recent study by an Indian expert group examined 762 randomly selected U.S. patents, and found that out of these, 374 patents were based on traditional Indian medicine. This knowledge, accumulated over generations, is now claimed as exclusive Intellectual Property to be re-sold to the world by highly controlled (and foreign) systems of distribution. Researchers at the University of Mississippi Medical Center tried to patent the use of turmeric in wound healing as their own novel discovery. An Indian challenge to this patent quickly provided 32 references (some more than one hundred years old and in Sanskrit, Urdu and Hindi), which showed that this use was well known in India prior to the filing of this patent. The patent claim was denied, and India created a Traditional Knowledge Digital Library to aid in future battles against the “biopiracy” of traditional knowledge by supra-national entities. The Nigerian author Chinua Achebe has said “Art is our constant effort to create for ourselves a different order of reality from that which is given to us.” Similarly, Beuys’ idea that the “concept of sculpting can be extended to the invisible materials used by everyone” proposes a hopeful and organic process by which culture can be made and understood. These ideas have been embraced, debated, altered, and improved upon by numerous creative thinkers responding to his statement. Here we have a wonderful demonstration of the copyleft model—that ideas or works are stimulated and improved upon through social circulation. I am happy to share with you an alternative model in this installation. Like Social Sculpture, you don’t literally have to be a visual artist to contribute. Simply by listening to music (an invisible, every-day material), you participate in an experiment with great potential. These works are given by their authors under a copyleft license. In general, this license permits unrestricted redistribution and use of these works so long as all copies are attributed to the original author and the same permissions are granted to all derivative works. That means you can copy, share, broadcast, and in many cases even re-make these works into new creations. Some of this music has been retrieved from the past, avoiding exclusive control by entities who bear no valid claim to profit from these works or limit their social availability. It is important to note that copyleft isn’t an either/or condition; the authors have not given up their own rights by sharing with you. They have simply added a degree of openness in the hope of generating more freedom and more creative works. Your thoughts on these issues are needed to explore and develop an even better model. Though these artists haven’t dismissed the economic value of their work, it is through these gestures of radical generosity that extreme corporate greed is countered. As Felix Gonzalez-Torres said, “I need a public to complete the work.” Here too, your participation brings the full poeisis of this work to light. As you use the materials of this installation they are not used up—the songs remain available to others, and the playlists you leave will be broadcast over the Internet as radio streams. As you burn these works you make them real. Abinadi Meza is a multimedia artist based in the Twin Cities, MN. Conceptually it is untenable that the quintissential attribute of humanity, namely creative expression, as an outpouring of our common spirituality, that very character that elevates us above base competitative materialism, should become at device for promoting a retrograde system of competitive marketing, thus removing a fundamental process for our individaul and collective spiritual growth and maturation from the generality of mankind into the obsolescent cul-de-sac of manufactured celebrity. For it is both through the appreciation and practise of art, that we are able to elevate our sensitivities, refine our sensibilities and draw nearer to that Sublime Unknowable, Uncreated Essence from which we originated. It is only through such refinement that the quality of our lives and consequently the quality of our civilisation may be advanced.